What if the Mayflower never left Plymouth England? As many Americans are preparing for their Thanksgiving feast tomorrow, I thought it appropriate to dedicate this Wednesday, What if? to the holiday. Alternative history stories are ones that peak my curiosity because they fit so nicely with my favourite question which is obviously – What if? So here are my Thanksgiving based What ifs? What if the Mayflower never set sail for the Americas all the way back in 1620? What if the Wampanoags living in the area had not been so knowledgeable about the land and experienced with dealing with other nations of people? Oddly enough while searching for an alternative history novel that deals with the Mayflower, pilgrims or Thanksgiving, I had difficulty finding one. If you know of any please share them in the comments below. Whatever the history behind the holiday was or could have been I always believed the most important part was in the thanks giving. I have a good life and have been surrounded by loving people and for that I am thankful. I always celebrate Thanksgiving with my new family here in England which sometimes seems as ironic as celebrating Independence Day. It is not the same as celebrating it in the US. It is one of those times of the year that I miss home. Have a Happy Thanksgiving my fellow Americans. This entry was posted in Wednesday - What if? and tagged History, Holidays, Mayflower, Plymouth Massachusetts, Plymouth Rock, Thanksgiving, United States, Wampanoag people. Bookmark the permalink. 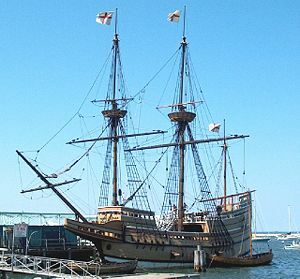 7 Responses to What if the Mayflower never left Plymouth England? I love this post. What if the Mayflower had landed somewhere other than where it did? Regardless of any alternatives, I’d still like to think that this day of Thanks Giving would have made its way into our history and our hearts. Hugs and enjoy your holiday! Thanks for the holiday wishes and cyber hugs. Hope you have a great holiday too! I can’t think of any. Maybe you should write one! It was surprising not to find any already written. Happy Thanksgiving to you!